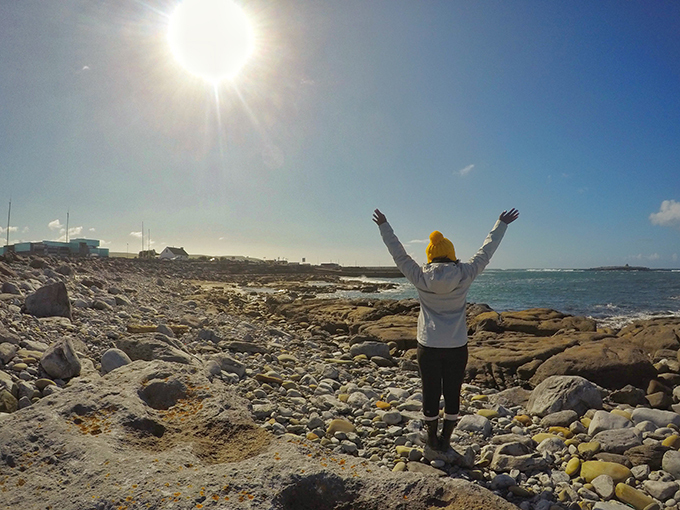 This year, when my group birthday plans got derailed, I decided to take a spontaneous trip to Ireland. 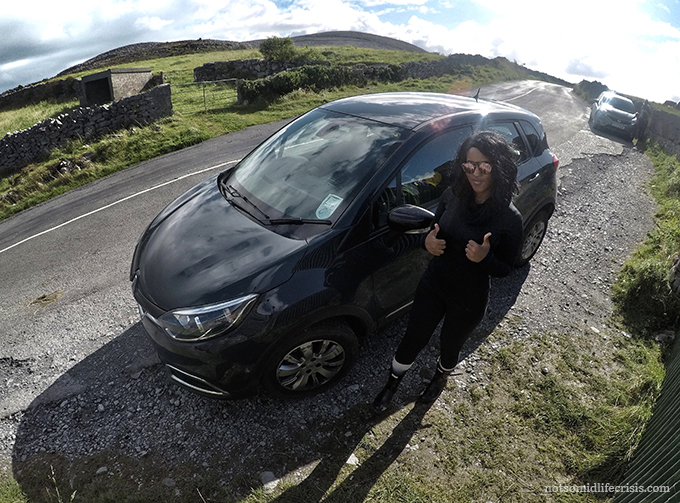 Feeling brave, I rented a car and drove all the way through Ireland and Northern Ireland and had an amazing time. Here is my 7-day itinerary! On the first day I flew in to Dublin Airport at around 7:00 AM and headed straight over to the car rental station to pick up my car. I choose to rent a Renault Captur which is a suv crossover that closely compares to a Volkswagen Tiguan or a Kia Soul. 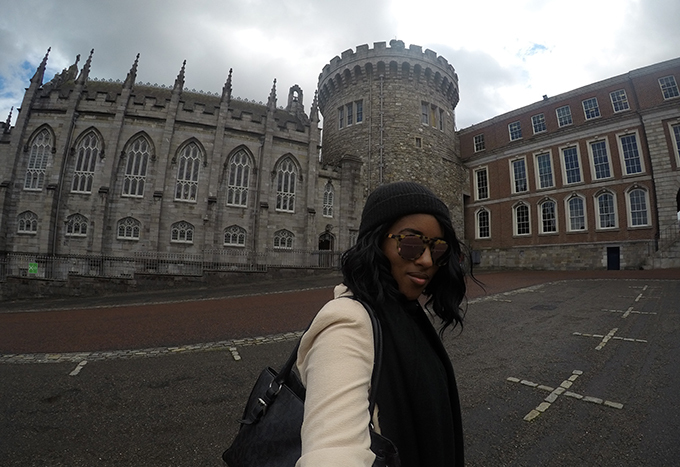 I headed directly into Dublin to check into my hotel and start exploring the city. 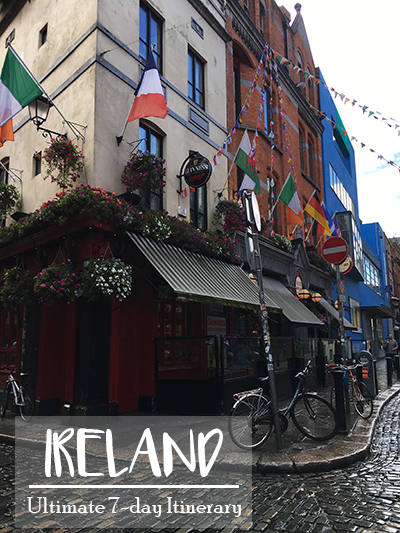 There was so much to see and do in Dublin! I started the day with a tour of Dublin Castle. Dublin Castle used to be home to the UK’s government administration in Ireland until the Irish War of Independence in 1921. Next, I walked over to St. Patrick’s Cathedral which is the National Cathedral for the Church of Ireland. You will be in awe of this place no matter what your religion. The architecture is absolutely stunning! After checking out Dublin Castle and St. Patrick’s Cathedral I headed back to the hotel for a quick rest before the bar crawl. 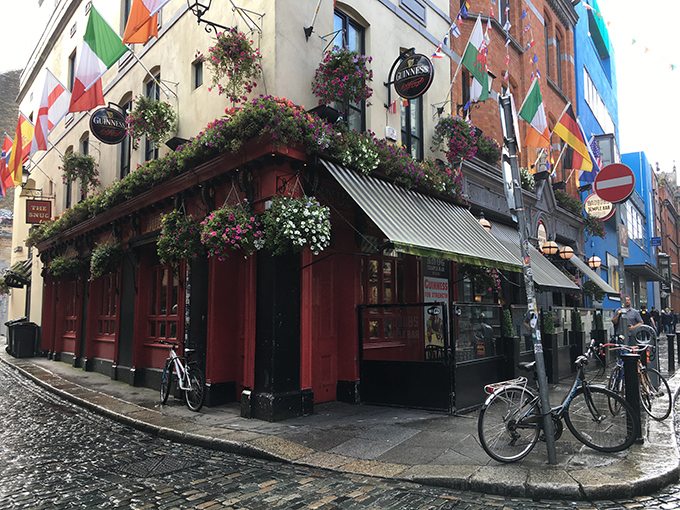 Dublin’s Temple Bar is world renown as the best spot to grab a drink at any of their many pubs. 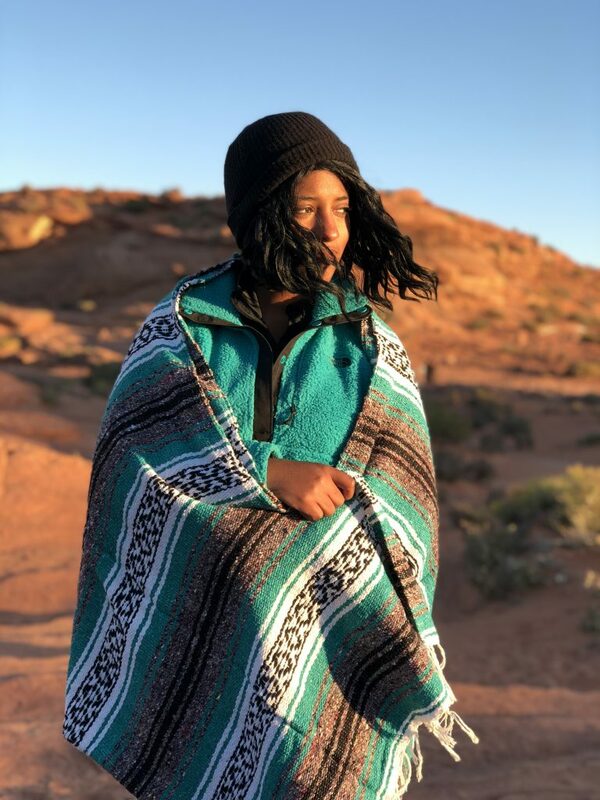 I wish I could tell you the names of all the bars I went to that night, but ­­­­Jamie Foxx said it best – blame it on the alcohol. I got an early start to the day with early entry to Trinity College. This is the best time to visit Trinity College because most of the tourists and students are still sleeping off their hangovers from the night before. 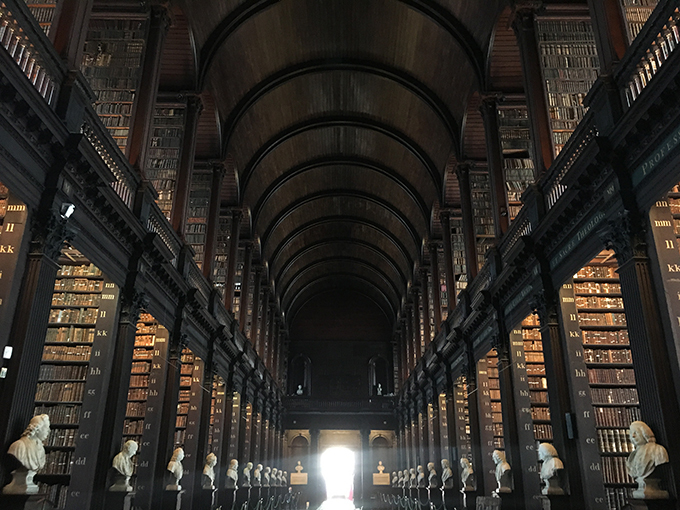 Be sure to walk around the campus a bit and of course check out the Book of Kells and the long library hall. After checking out of the hotel it was time to start driving! My first stop was the Powerscourt Waterfall. 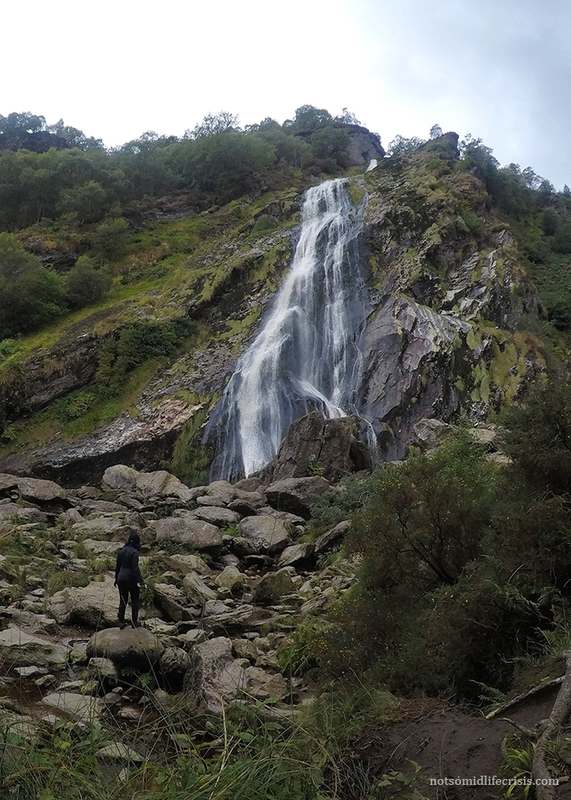 Powerscourt waterfall is the tallest waterfall in Ireland and sits 396 ft. tall! If you have additional time, stop by the main grounds and visit the Castle as well. After I finished chasing waterfalls, I headed towards the town of Kilkenny. 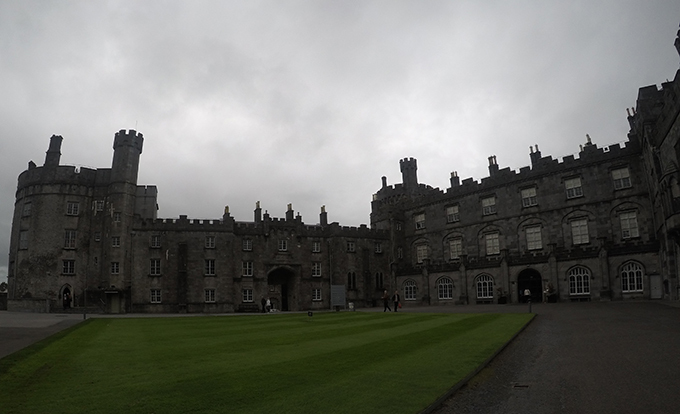 Kilkenny is a great little town with lots of shopping, restaurants, and of course Kilkenny Castle! I stopped here for lunch as well. Next up, I headed towards the town of Cork. I was going to check out Blackrock Castle but since I arrived on a Sunday night, I didn’t have enough time before it closed. The hotel owner where I was staying totally salvaged my night when he offered that one of cute guys on the staff that he could go home early if he took me out that night. A night out with a cute guy who has a job, all his teeth, and an Irish accent?? You don’t have to ask me twice! 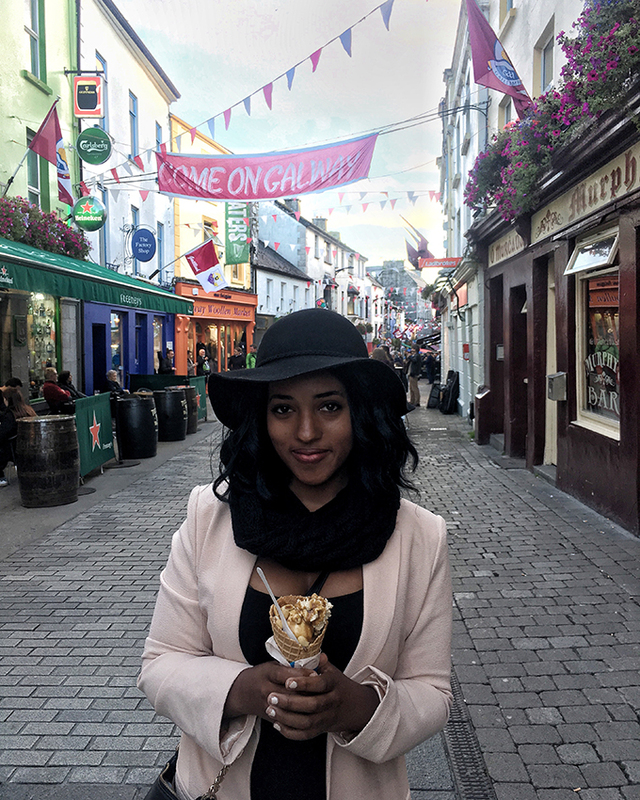 We went out in Downtown Cork and had an amazing time dancing the night away! The best part about my hotel was that it was right outside of the Blarney Castle! 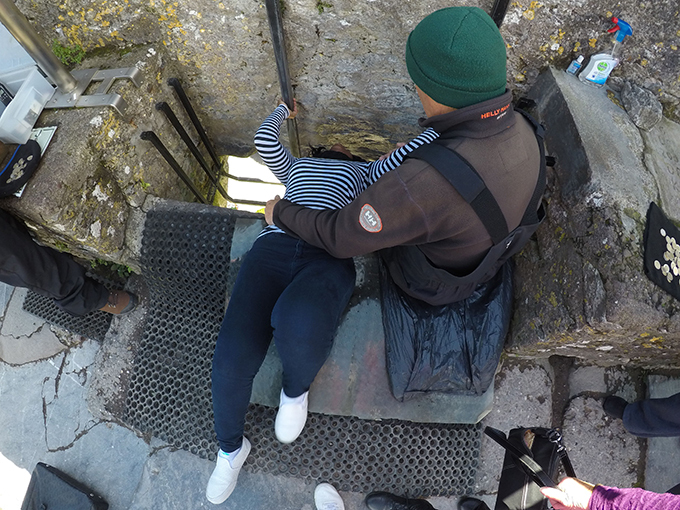 Head over first thing in the morning to beat the crowds of people who want to kiss the Blarney Stone. I got in line at about 11:00 AM and the wait was already over an hour long. After you kiss the stone and gain the gift of eloquence explore the 60 acres of gardens and of course the Blarney House. Naturally, I have stop at every waterfall so the Torc Waterfall was my next stop. 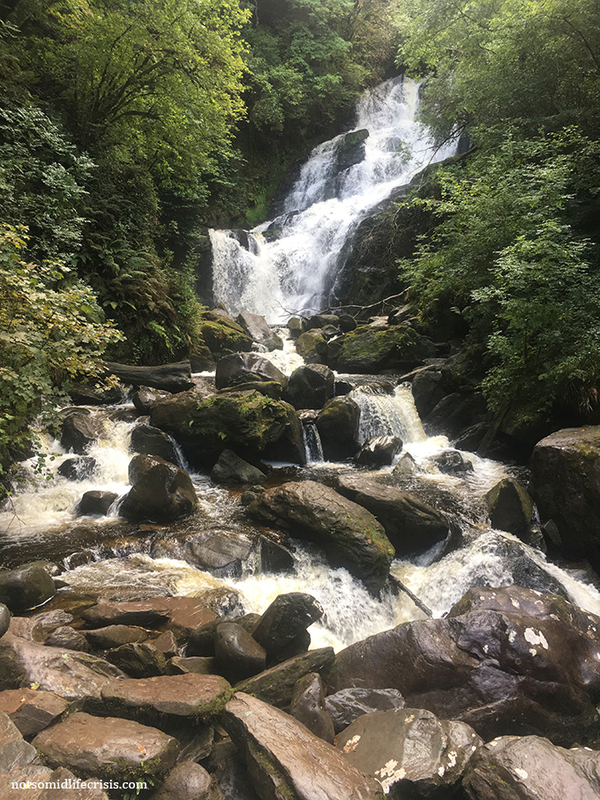 Torc Waterfall is located at the base of the Torc Mountains in Killarney. 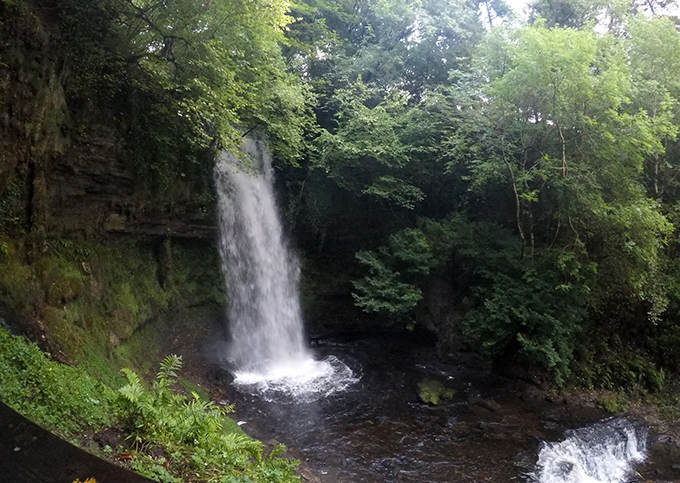 The falls are about a 5 minute walk from the car park and there is also a hike that goes above the waterfall as well. Getting from the parking to the waterfall is pretty easy but the hike above the falls has a lot of steps. 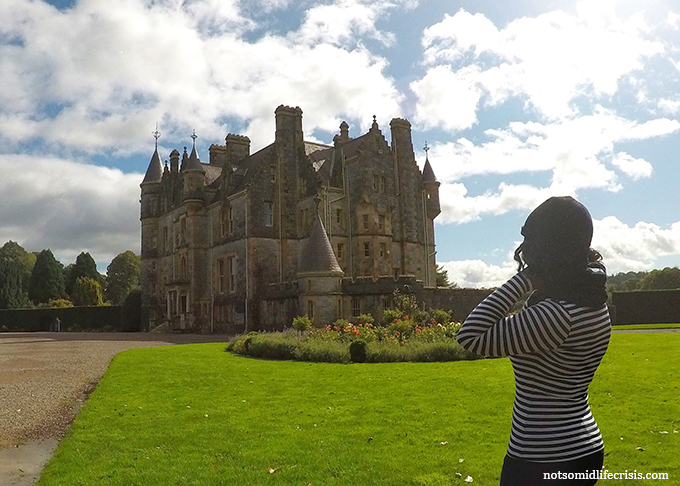 A few miles down the road from the Torc Waterfall is a 19th-century mansion, The Muckross House. 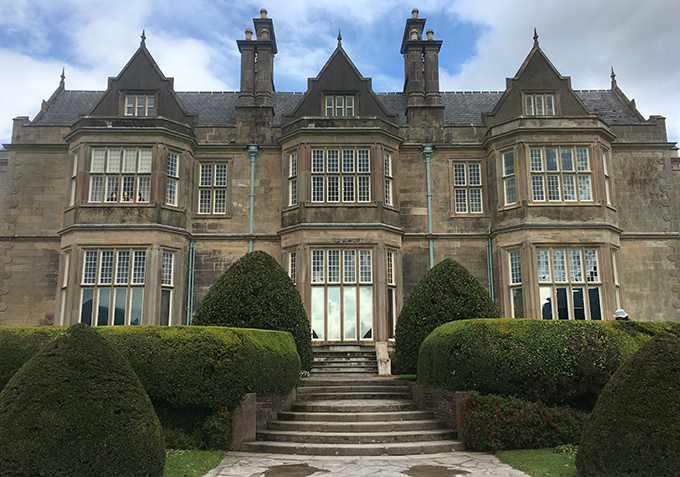 You can walk through the Muckross house and explore the multiple gardens. They also have horse drawn carriage rides that go around the lake but unfortunately it started heavily raining before I got to take one. With a coffee in hand, I got an early start on day four. The Cliffs of Moher are Ireland’s number one visited tourist attraction and they get extremely busy! 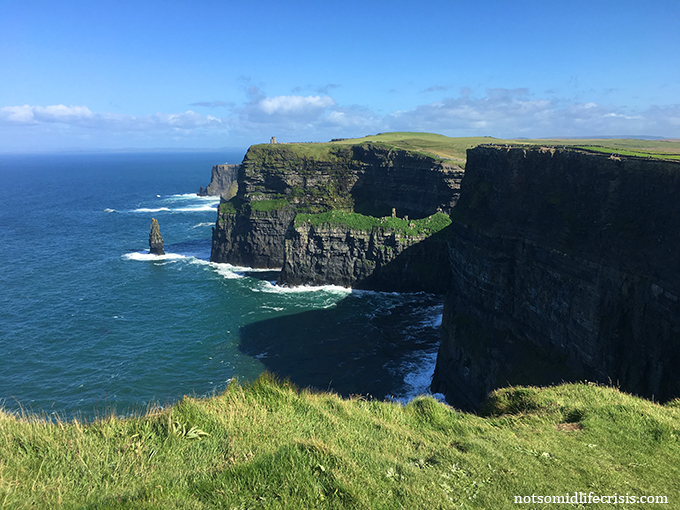 (Also, the parking lot is relatively small for the number of people that visit) Harry Potter fans will recognize the Cliffs of Moher as the location of the caves where Harry and Dumbledore travel to find the horcrux in The Half-Blood Prince. It is a bit of a walk, but it’s worth it to heads towards the left of the visitor’s center because the safety ledge ends and you can actually dangle your feet over the edge of the cliffs. Just be careful because it does get windy when you’re 702 ft up. I grabbed a quick lunch at the visitor’s center before heading back to Galway. I spent the rest of the afternoon shopping and exploring downtown Galway. If you’re in the mood for something sweet, Murphy’s Ice Cream has one of the most delicious salted caramel ice creams. There are a bunch of great pubs with live music also! Unfortunately, I couldn’t find Ed Sheeran but I still felt like a Galway Girl for the night. Travelling from Galway I headed towards Connemara National Park. Connemara National Park is absolutely beautiful to drive through, I can only imagine hiking on one of its many trails. There are plenty of spots to stop and take photos of the breathtaking scenery but be sure to watch out for the sheep that like to hang out in the road. Kylemore Abbey was my favorite castle in Ireland and is located deep in Connemara National Park. 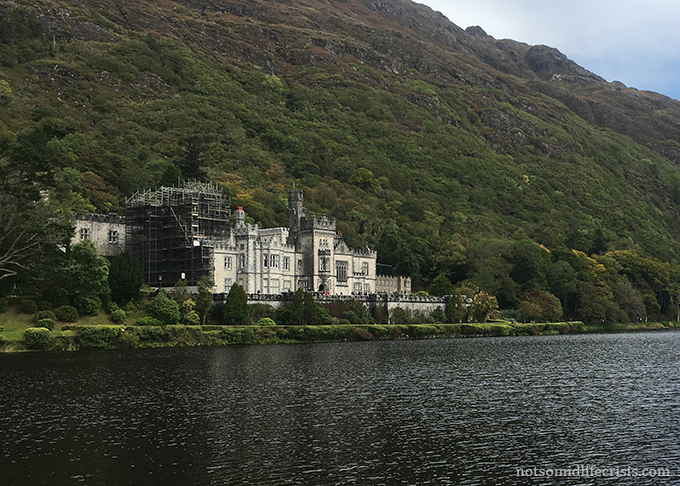 Kylemore Abbeys is Benedictine monastery that sits nestled in the woods and overlooking the lake. It seriously looks like something out of fairytale! I almost missed the Glencar Waterfall because it’s a bit off of the main road but it’s definitely worth a stop for all waterfall chasers. I spend the rest of the day driving to Belfast. Its about a 5 hour drive and I decided to stop for dinner in Sligo. I recommend eating at the cozy, Irish pub, Hargadon Bros. Their apple crumble was delicious! I started day six by checking out Giant’s Causeway. 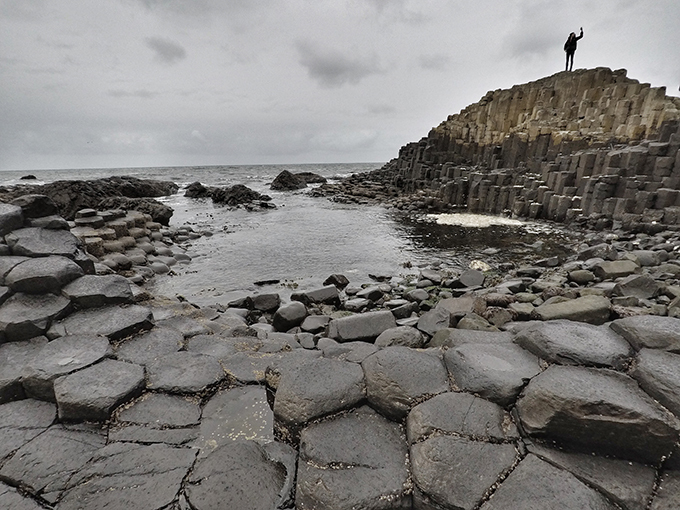 Giant’s Causeway is made up of natural, hexagonal basalt columns and is on the north coast of Northern Ireland. It’s easy to see why it was named the fourth greatest natural wonder of the United Kingdom. 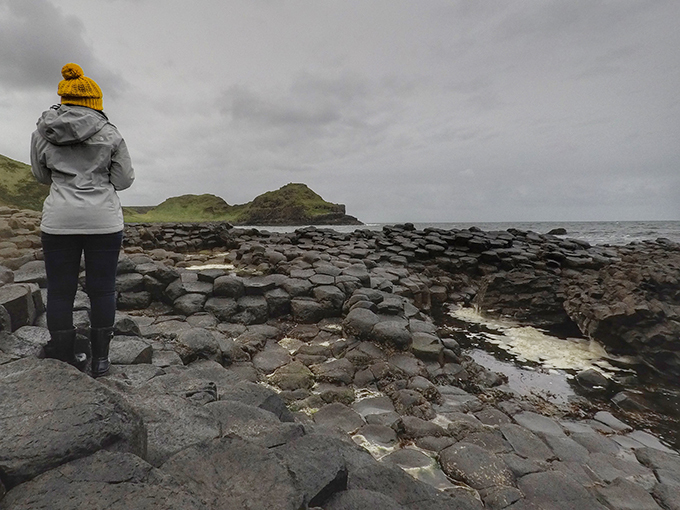 (They also reminded me of the basalt columns in Vik, Iceland) Tip: It’s free to enter Giant’s Causeway if you go through the archway on the side of the visitor’s center. Don’t be fooled into paying £8.50 just to go in to the visitor’s center. 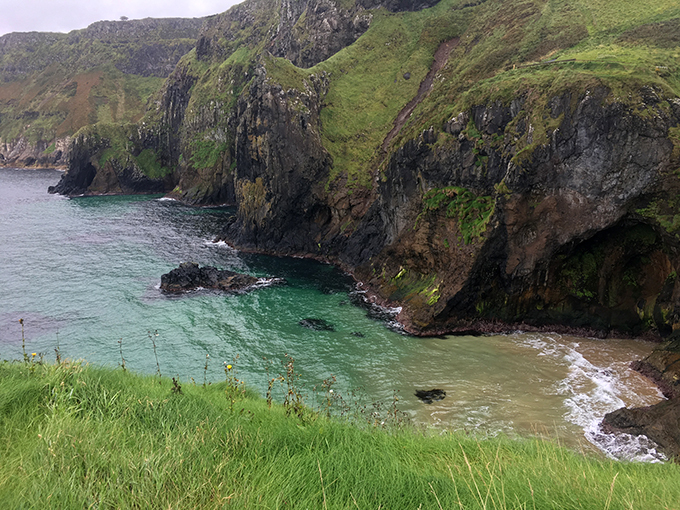 The Carrick-a-Rede Rope Bridge is a short drive along the coast from the causeway. The bridge is 66 ft long and sits 98 ft above the rocks and ocean below. The views of the turquoise blue water beneath you make it all worth it. 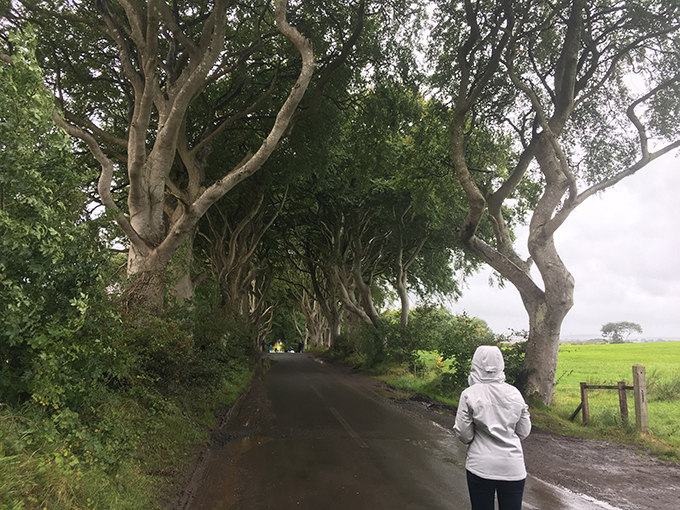 In search of more Game of Thrones filming locations, I headed to the Dark Hedges next. Personally, I found this location completely underwhelming. Each side of the road was lined with vehicles and it looked nothing like it did in the show. On my last day I took an early walking tour of Belfast which lasted about 3 hours. It was a great way to get a condensed Belfast experience through downtown since my flight was later that afternoon. After the tour I headed back to Dublin airport which was only a short 2 hour drive from Belfast. 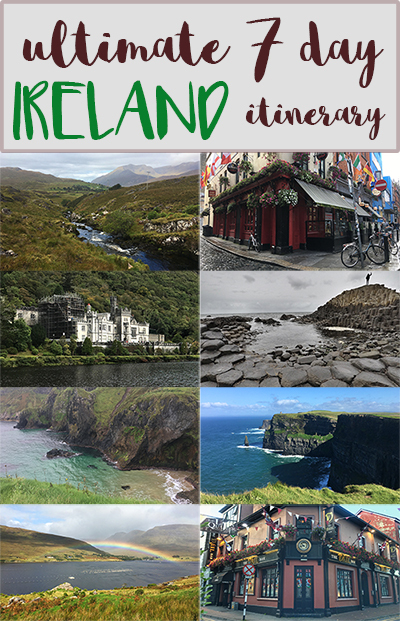 Have you roadtripped through Ireland? What are some other places where you stopped?